The warm weather has awakened my inner fashionista from her winter slumber. She was in a bit of a rut the past few months, tired of being buried beneath heavy parkas, sweaters and mitts. But she's alert, back with a vengeance and ready to reclaim the streets as her runways. See you out there. Beret, borrowed from my BFF. Shirt, Dalia Collection from Winners. Skirt, American Apparel. Shoes, Winners. Necklace, The Bay. Chain Bracelet, vintage. Chunky bracelet, The Bay. Purse, Forever 21. Oh my...I love the colour of the top!! Love this! one of my favourite outfits of yours! Ooooh! This one I like very much! 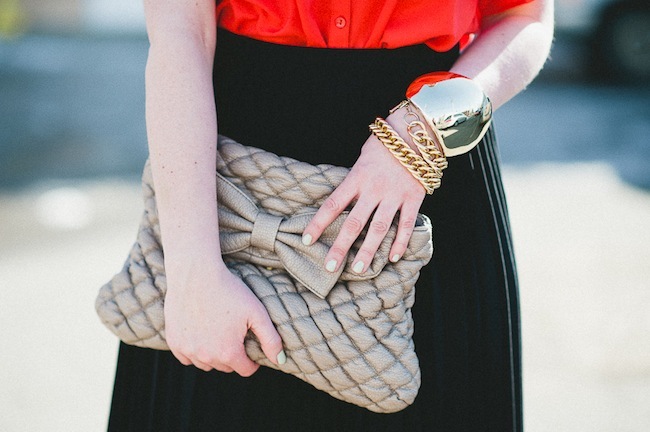 One bright with lots of neutrals and accessories. Perfect! This is so beautiful! You look great! 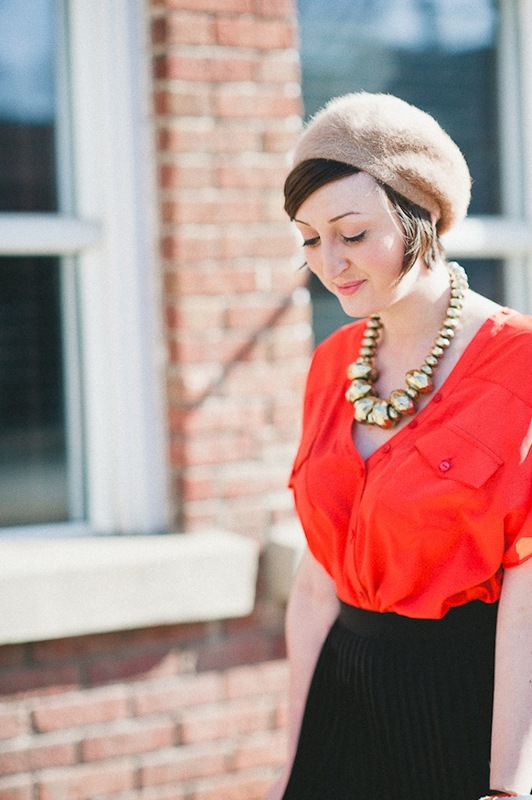 Love Love Love the bold necklace! This is such a pretty look. 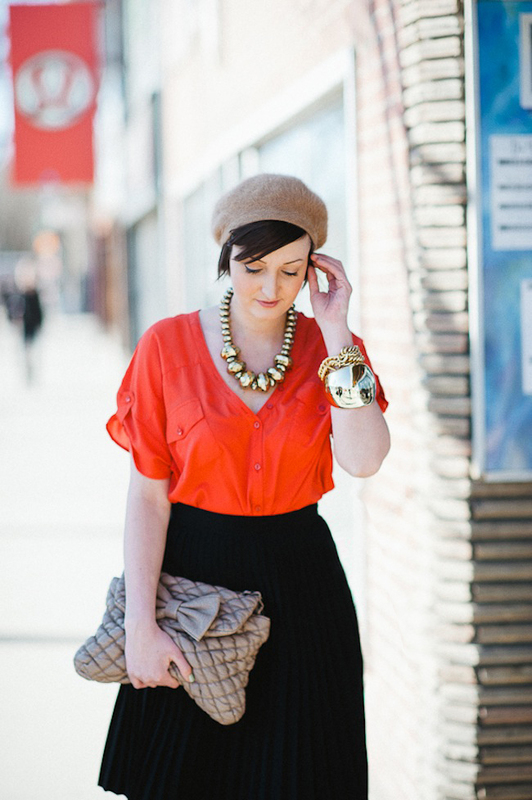 i love the bold colors and accessories. Jealous of the bare legs! We thought spring was coming & the snow was melting...and then winter chose to stay...ugh! You look fantastic, I love all your accessories! I love this outfit and these photos of you are gorgeous!!!! This is such a lovely outfit! 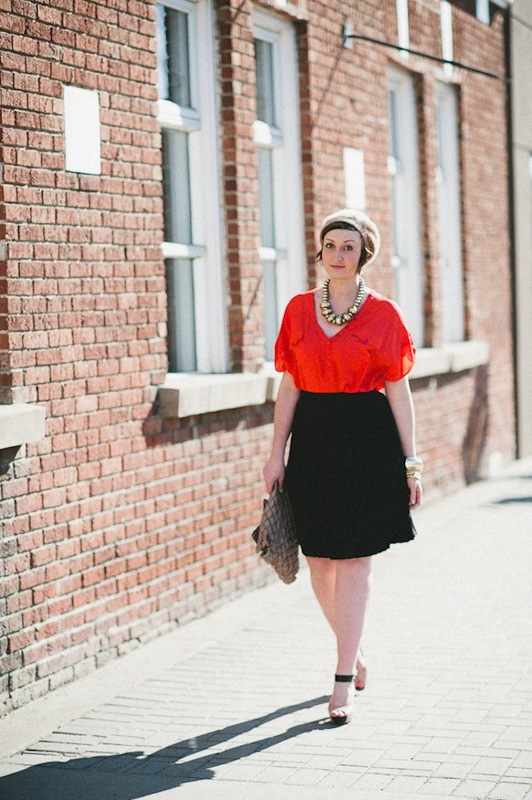 I love the bright happy colour of that pretty blouse and that stunner of a statement necklace! I love your fashion!! What a cute outfit! I especially loved how you added in the beige hat to boost your chic-ness!